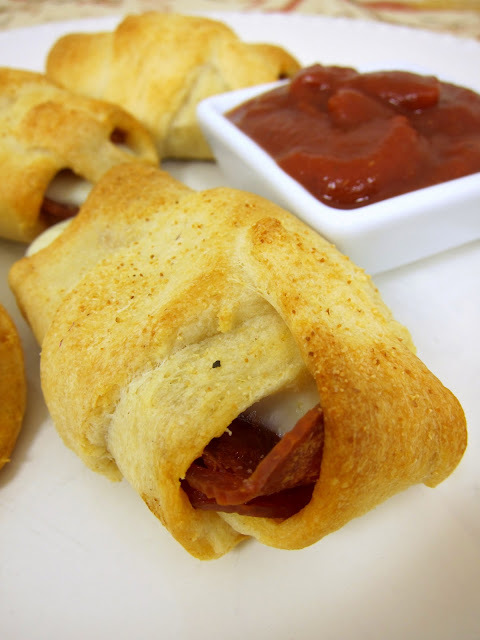 Crescent Pepperoni Roll-Ups - only 3 ingredients! 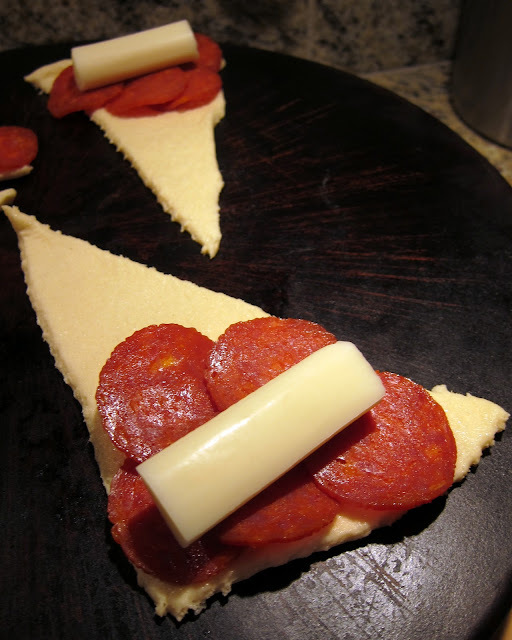 Great for an after school snack or fun twist to pizza night! Serve with a side of hot pizza sauce. After all the holiday cooking last week, I needed some simple recipes for dinner this week. I saw these pepperoni rolls on Pinterest and decided to make them for pizza night. This is one of those "why didn't I think of that" recipes! I can't believe I've never thought to do this before. I like to use turkey pepperoni on pizza. My favorite brand is Bridgford Turkey Pepperoni - it tastes just like regular pepperoni, but it isn't greasy! You can also microwave the pepperoni for a few seconds to crisp it up. These pepperoni rolls were so simple and super tasty! We will be eating these again very soon! Unroll crescent rolls and separate into 8 triangles. Place 5 slices of turkey pepperoni on each crescent roll. Top pepperoni with string cheese half and roll up. Sprinkle crescent rolls with garlic powder. Place rolls on baking sheet and bake for 12-15 minutes, or until golden brown. Serve with a side of warm pizza sauce. I really enjoy reading your blog. You have a lot of quick and simple recipes that looks delicious. Thank for sharing. This is on my to make list from Pinterest too. I've never heard of that pepperoni brand. I'm gonna have to keep my eyes peeled! How easy. I luv crescent rolls. I also like to use turkey pepperoni on our pizzas. I dont wants no Jive Turkey in mines crexent rows ! I saw these on Pinterest, too. My son loves them! So quick and easy! I made these last night, but I switched out the pepperoni for Turkey sausage crumbles. Family loved them. Made these for dinner last night! They were a huge hit -- even with the kids (who usually take a while to warm up to a new dish)! I did use regular pepperoni instead of turkey (because I already had it on hand). I was afraid the extra grease would make them turn out soggy, but they were perfect! I'll try the turkey pepperoni next time, just to try something new. I found these on pinterest and made them the other night. My family ate them up! PS - I love how seasoned your round stone is! You are killing me with all this great tailgate food this year. These look so good. We're going to try these!!! I'm on Weight Watchers so I used turkey pepperoni, reduced fat crescent rolls, and light string cheese, and they turned out awesome!!! I will definitely be making these again. Thank you! like many of your other readers, i found this on pinterest. i've got the ingredients in the kitchen and am going to make these for dinner. looking forward to browsing (and probably pinning) some of your other recipes and ideas! I made these the other night for my partner's & my Christmas celebration. They were AWESOME & sooo easy! Made these last night for the Saints football game, they were a big hit. My very picky son loved them and asked if I could make some more. They were gone in a flash. Super easy and yummy! Just made these for dinner tonight! They look great! Can't wait to try them with the kiddos! just made these for Senior Bowl snacks and they are amazing! I puta little dollop of sauce right on the roll before I put the pep, then served with ranch! I also used some Canadian bacon, great! GOTTA LOVE PINTEREST! These were great. We had them with homemade ranch! They will be a staple at our house! Has anyone used shreaded cheese instead of a cheese stick?? Wonder how they would do in a lunch box, either cooked the night before or in the morning. Might have to try that for my very picky son. I thought these were very tasty! I love that the crescent roll gives the "crust" a different flavor. I could have eaten a hundred of them! Unfortunately, my eight year old did not like the crescent roll and refused to eat anything but the pepperoni and cheese dipped in sauce...but what does he know???? LOL Plus, it really wasn't enough for a dinner for an eight year old, a five year old, and me. But I think I will use it as an appy recipe, cause I think they'd go over HUGE! Consider me on board with these!!! My 16-year old will love these! Thanks for the crescent roll/pizza idea! This was great for my husband to do with the kids for lunch - thank you for the great idea. This is an awesome recipe!! I was wondering if they can be prepared ahead of time & frozen? If so, when they are taken out of the freezer, what temp would you bake them at, & for how long? Thanks. RiRi - you would need to bake them first and then freeze them. You can pop them in the microwave for about 30 seconds when you are ready to eat them. Crescent rolls won't rise as well if you freeze them before baking. My toddler (Hila Fay) & I made these the other day for lunch. She had so much fun "heppin" me! Thanx for the idea! I forgot to pin up the sides, sure wish I had remembered that step! I posted a blog about it, and linked your blog, hope you don't mind! These are awesome with Kraft Basil Tomatoe cheese sticks. I make them at least once a week! Those are so neat!! Love them. Found you from realruralmom's post. Wonderful!!! Just made these! Was out of pasta sauce so we ate them with ranch. I really think they would have tasted better with the sauce! But they were still really good! My dd made these when she went babysitting. They loved them so much that the mom asked for the recipe and I printed the recipe from your site giving you credit. We've had them for dinner several times and we're having them again tonight. We especially like them with the swirl cheese sticks. Julia - what kind of pan are you cooking them on? Sounds like your pan might not be insulated and that is causing them to burn. I just made these for lunch for the kids, they loved them!! So Easy! Made these tonite but used regular pepperoni and the new tomato basil string cheese. Delicious!! Coming here from Pinterest. Followed recipe as written and may I say, "YUMMMM!" This is definitely going in the rotation! Looking forward to coming up with other variations! I like to sprinkle a little Italian seasoning on them with the garlic powder. I had these for supper tonight while I was babysitting my two nephews (10 and 8) and my niece (12) and they loved it. They made them. They are extremely filling. I served them with warmed up spaghetti sauce I had on hand. I did omit the garlic powder! Not a fan personally. Thank you so much! It was a blessing because I had coupons so I was able to do it on the cheap! Thanks for the great recipe, my family loved it. I blogged about it with links back to you and credit. Thanks again. We loved it. Oh, here is the link to my blog with a link back to you. I made these today with Hormel turkey pepperoni, reduced fat crescent rolls and light string cheese. They turned out delicious. Thanks, Jenn. Just made these with Garlic Butter crescent rolls. My kitchen smells amazing! Thanks for an easy, yummy recipe. These are so easy and SO tasty! They're just like Hot Pockets, only homemade and much tastier. I featured my take on the recipe here! These are so easy to make and pretty tasty to! I make these about once a month, my 9 year old daughter loves them!!! Have you tried Boars Head turkey pepperoni? Absolutely the best brand I've tried. Made these last night, So easy and wonderful, thank you for sharing. My son would definitely love to have this. I will be making it for him next week. These were good. For those of you that mentioned the rolls burning on the bottom,use parchment paper. I also spread a little,sauce on mine before baking. I did not have string cheese so I cut pieces of cheese from a block. It worked fine. I made these for the second time tonight. They are delicious!